Peter Lothian Nelson and Walter Block advocate market-driven, private initiatives in space exploration. 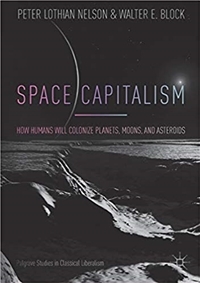 This marvelous book compares and contrasts the motivations, morality, and effectiveness of space exploration when pursued by private entrepreneurs as opposed to government. The authors advocate market-driven, private initiatives to take the lead through competition for the exploration and exploitation of outer space. Space travel and colonization are analyzed through the prism of economic freedom and laissez-faire capitalism, in a unique and accessible book. Space Capitalism goes boldly where no one has gone before! Click here to watch Dr. Block make the case for privatizing the final frontier. Peter Lothian Nelson has masters degrees in engineering and divinity. He has over 40 years of experience in civil engineering and forensics, and is the former president of PL Nelson Engineering Inc, USA. Walter E. Block is Harold E. Wirth Endowed Chair and Professor of Economics, College of Business, Loyola University New Orleans, and senior fellow at the Mises Institute. He earned his PhD in economics at Columbia University in 1972. He has taught at Rutgers, SUNY Stony Brook, Baruch CUNY, Holy Cross and the University of Central Arkansas. He is the author of more than 500 refereed articles in professional journals, two dozen books, and thousands of op eds. He lectures widely on college campuses, delivers seminars around the world and appears regularly on television and radio shows. He is the Schlarbaum Laureate, Mises Institute, 2011; and has won the Loyola University Research Award (2005, 2008) and the Mises Institute’s Rothbard Medal of Freedom, 2005; and the Dux Academicus award, Loyola University, 2007. Why Privatize Space Travel and Colonization? Who Are the Libertarians in the Space Initiative? When something is unowned, people have less of an incentive to care for it, preserve it, and protect it, than when they own it.